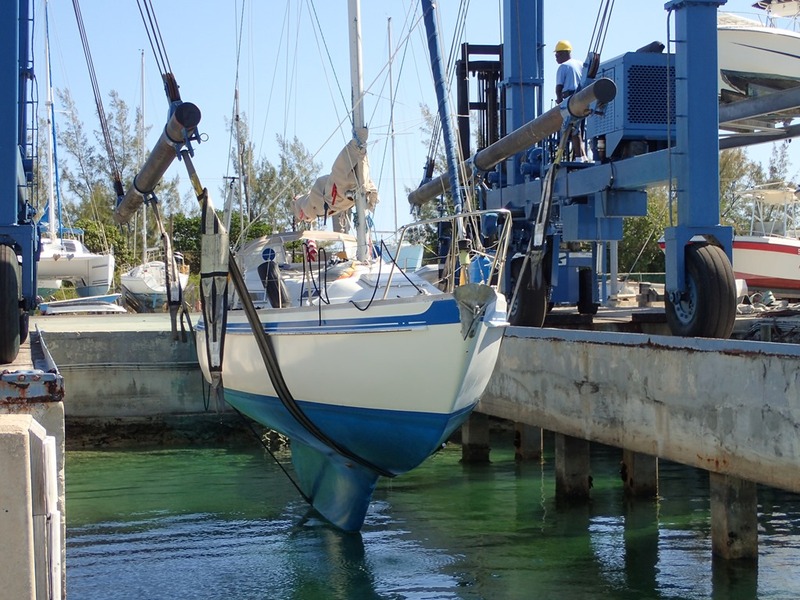 Last week Motu Iti was hauled at Abaco Yacht Services in Black Sound, Green Turtle Cay. Up, up she comes. 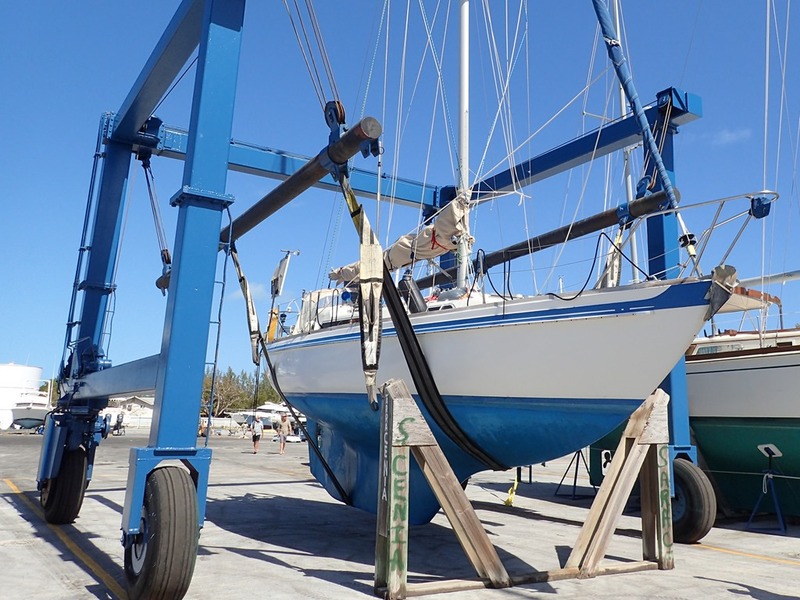 Where she is cradled, blocked, strapped and stanchioned. 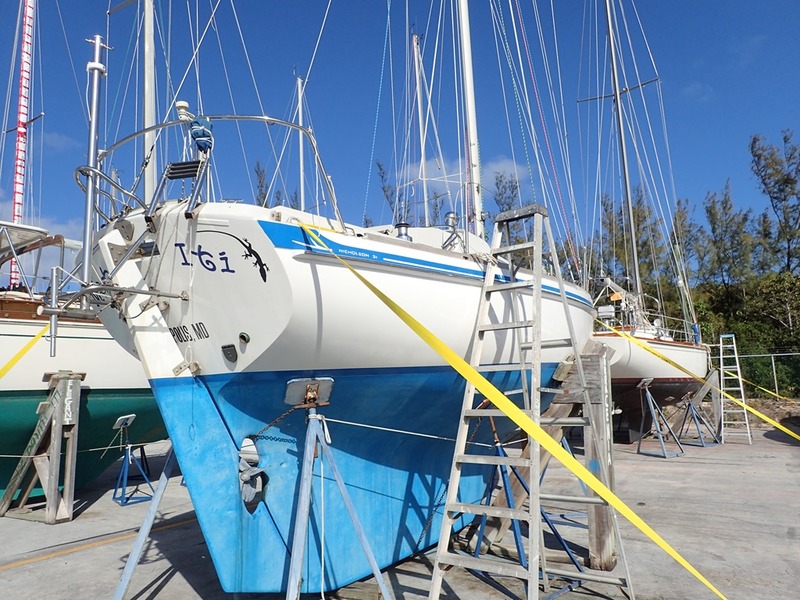 And her tiller and all her sails and canvas are removed and stowed; her boom is tied down on deck. The stanchions are chained and tied together. We wish her all the best over the summer and hurricane season. She’s as ready as she can be – we just hope it’s enough. Lots of hurricanes last year, but, luckily, no direct hits. 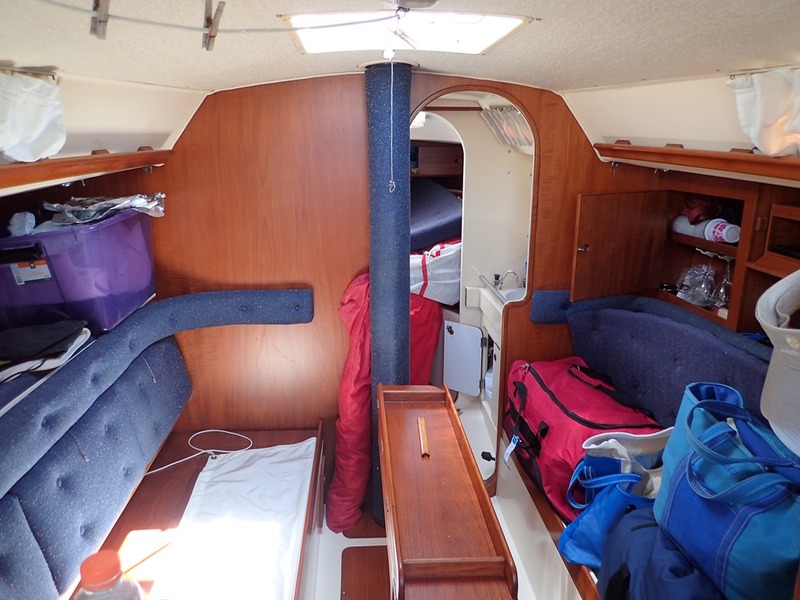 Inside, every part of the boat gets cleaned. Every item is pulled out of every locker and every surface is wiped down. Items are inventoried and a “to bring” list is made for next fall. 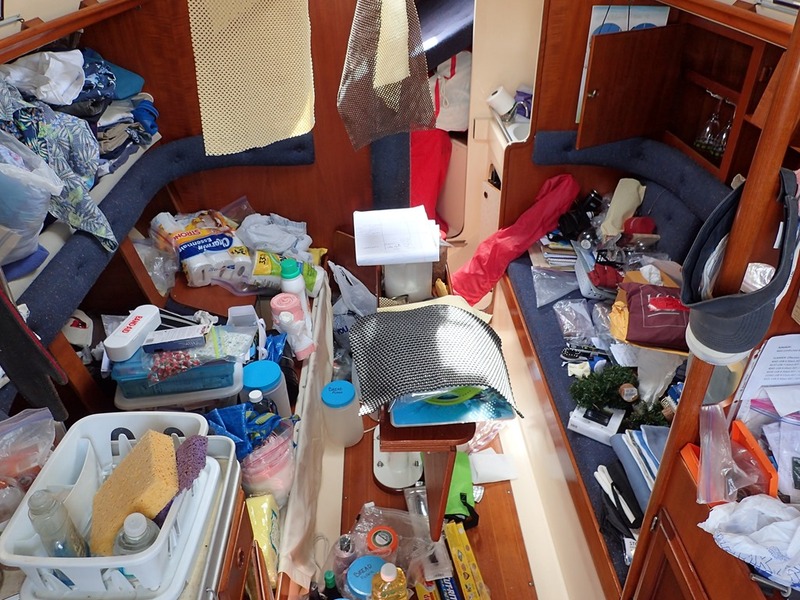 Even with our small boat, this bi-annual cleaning ritual takes at least three days. Mostly we do it to prevent mold growth over the summer. Finally, it’s done. All neat and organized – even the suitcases are packed and ready. Time for one more walk on the beach to enjoy that unbelievably gorgeous water. Tomorrow we say good-bye to Motu Iti and fly to CA. Safe travels! I’ve so enjoyed all your posts… beautiful pictures and good stories! Now for the fun of settling into your CA home! Thanks so much for following us. Now to CA to clean some more. Come visit – we promise not to make you help clean. Thank you for an entertaining season. Wish we were there! Thanks for reading our blog. So good to hear from you. Come and visit. I will miss your stories and stunning photos but am happy to think of you in CA with your family! Safe travels! 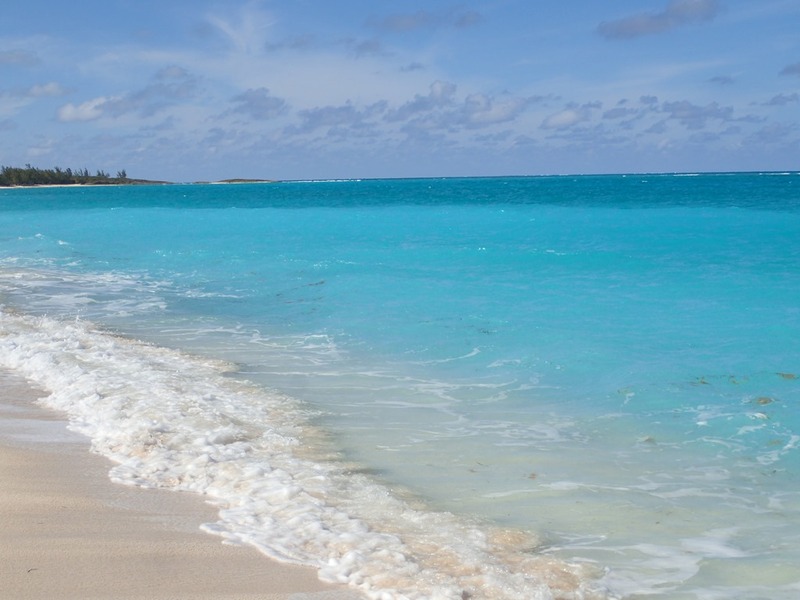 Guess Tami & I need to come to CA for lunch so we can catch up…..
Another winter in paradise is over ! Thanks for all the tantalizing stories and photos. Enjoy you CA home and grandparenting 😊.